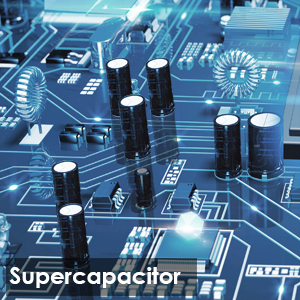 Super night vision, powered by a supercapacitor that resists extreme temperatures from from -4 to 158°F extending the life span. 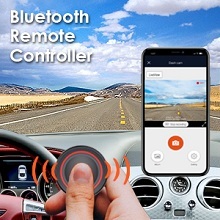 With built-in Wifi, GPS, an easy-to-operate Bluetooth remote controller and a Roadview APP that allows you to change various camera settings on your iPhone or Android device. 1. The dash cam support up to 256GB (class 10, memory card is not included ), but Samsung Pro Endurance 64GB (genuine card of class 10) card is recommended. Please format the card before first use; Note:Samsung Micro SD cards would only be made in either Korea or the Philippians. Please be sure to buy a genuine samsung evo card. Please long click the Bluetooth button to match the dash cam before using. 2. Before mounting the dash cam , please clean the windshield using water or alcohol and wipe clean with a dry cloth.The dash cam doesn't suitable for Vertical Glass. The Dash Cam captures 4 lanes of traffic through the F1.8 wide plus 6 glass lenses aperture and 170° wide viewing angle. While Ambarella A12A35 chip , OV4689 sensor can get the car license plates as well as road signs without distortion at 1920x1080P@ 30fps or 1280X720P @30fps. With the built-in Wifi , you can connect seamlessly to the mobile app available for both iOS and Android devices. 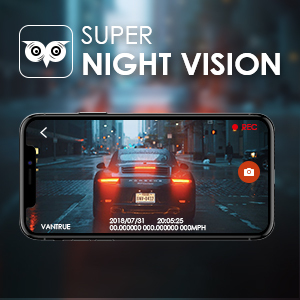 It allows you to change the settings, live viewing, immediate playback , upload, share footage and snapshot directly on Facebook, Twitter, and any other social platform via smart phones through the Roadview APP. Live Dash cam also allows playback and download of the files on a laptop. 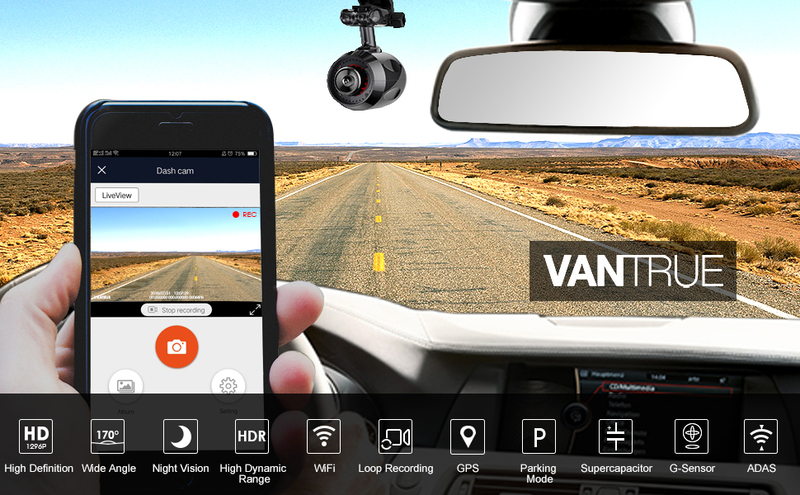 With the built-in Super capacitor, dash cam provide greater heat & cold endurance. With -4 – 158°F operating temperature, it’s safe to use in high heat and cold environments and will likely last longer and more reliability than a battery powered dash cams. 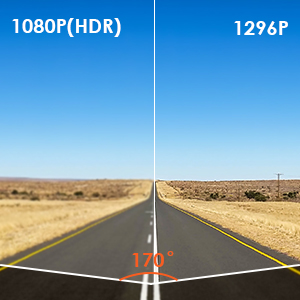 The unique High Dynamic Range( HDR) technology which automatically balance exposure and light/dark spots to pick up greater detail in dark, greatly provides night vision at low light environment to make driving more safer and reliable at night. 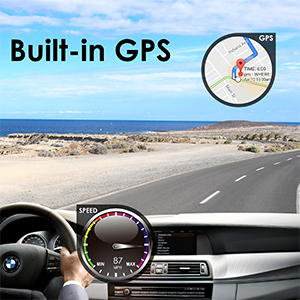 With inbuilt GPS, the live car camera allows you track location, direction, speed(KM/H or MP/H) , date, and time on your phone or PC which can be extremely useful in the unfortunate event of collision. 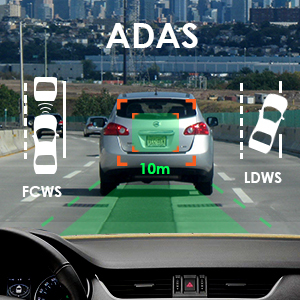 Equipped with ADAS (Advanced Driver Assistance System), the dash Camera provides in Forward Collision Warning and Lane Departure Warning in real time, protecting you from accidents, dangerous weather, traffic or other dangerous conditions. Seamless Loop Recording overwrites the oldest footage with the newest upon filling a card to capacity and the Footage will be stored in loops of 1/2/ 3/ 5 minute segments according to your setting. 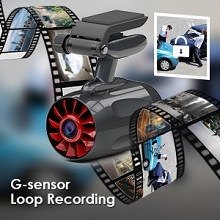 While the variable sensitivity G-sensor auto detects a sudden shake/collision or accidents locks the footage to "Event File" to prevent that video from an overwrite. Auto switch the dash camera to Parking Mode when it senses no movement in 5 minutes. Triggered by the Motion Detection, the car video recorder will auto record when people or things come closer to your car from in front. 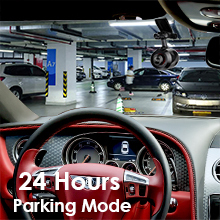 To use the parking mode, please buy a micro hardwire kit or connect it with an external battery. 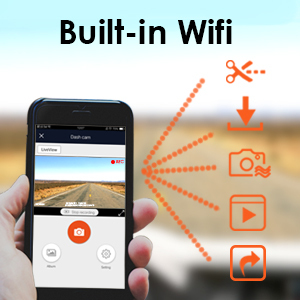 The wifi car camera comes with an easy-to-operate bluetooth remote controller, single click for snapshot a photo; Double click for capturing an emergency video to the Event files.You won't miss any moment even at a high speed. The dash camera is very easy to install. 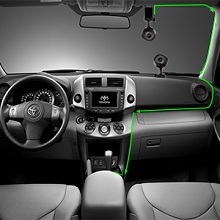 The Rotate Display Function offers you an alternative option to mount the dash cam upright on your dashboard. The video displayed on the phone will be adjusted according to the position where the car camera is placed. It support up to 256GB card, but 64GB card is recommended.